Remember that tiny paper piecing project I mentioned, well I got it started. I had a quilt guild board meeting last week and I was able to get 25 of these done. 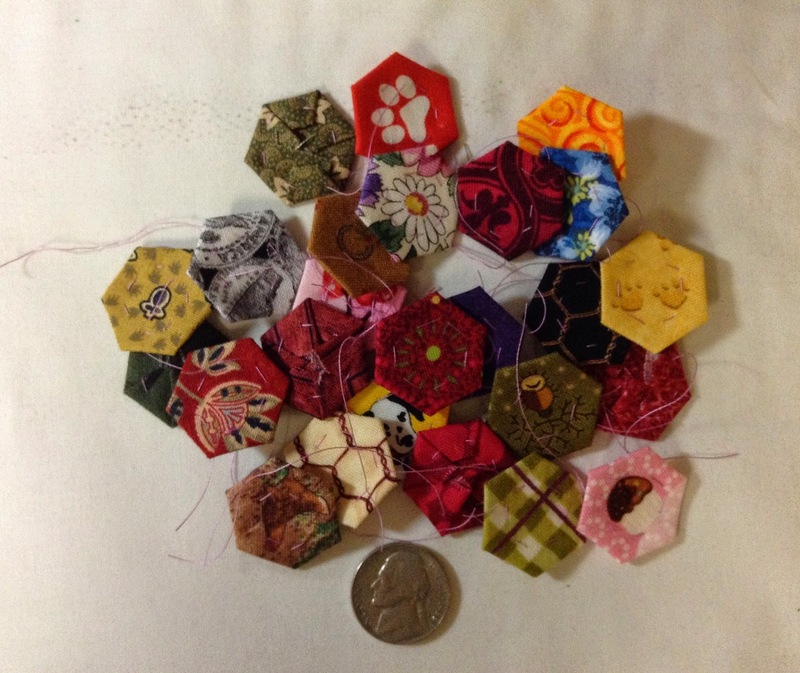 Just seven more meeting like that and I'll have the hexagons all done! They do baste up pretty quick and they are just so stinkin' cute. We have been dealing with vehicle problems. Two weeks ago Friday, I drove the car home from work and it was making a weird noise. The water pump had gone bad, plus we found that the oil was leaking into the radiator. We were supposed to go to a wedding out of town on Saturday but I didn't want to risk driving the van on a long distance trip. Good thing too...Wednesday on my way home from work the breaks went out on the van...talk about a scary ride home! Finally everything has been fixed, keeping my fingers crossed! We have started looking for a home in the country to move to, so the vehicles have to last until we buy a new house. We won't be able to buy a new house without selling our current home first if we have a car payment in our expenses. So I keep saying after we sell our house then we can buy a new vehicle to replace the van.